You may have heard about our most recent project last December. 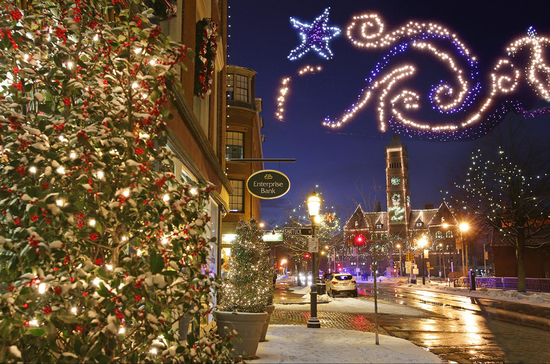 The Downtown Holiday Display program wasn’t part of the five ideas coming out of the 2015 Community Idea Summit, but it was a great showcase of how a group can come together quickly to take advantage of an opportunity and set themselves up for the future. 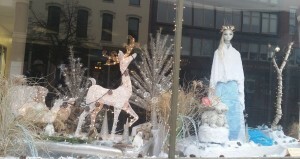 In a nutshell, we helped decorate downtown storefronts with art, merchandise displays, or other decorations, but the story might contain lessons for others. This idea wasn’t new. In fact, a community member suggested a similar idea, and it was very close to being one of the top ideas in 2015. 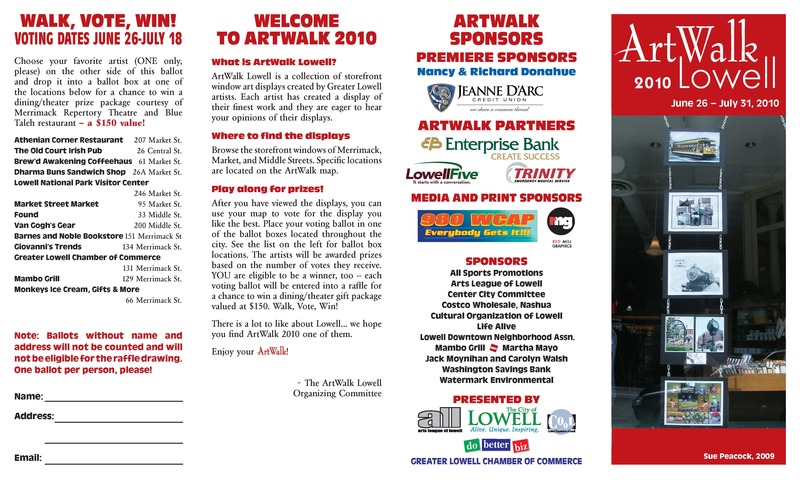 Additionally, Aurora and I learned that Lowell had a summer Art Walk several years ago, sponsored by local institutions and philanthropists. However, the timing and exact nature of the Downtown Holiday Display program came from learning that City of Lights includes a decorating contest with prizes up to $125, but only a handful of businesses usually participate. The theme was “Sparkly, Snowy, Spectacular,” broad enough that everyone should be able to participate. Also, by participating, businesses would be listed on a ballot for people’s choice awards. 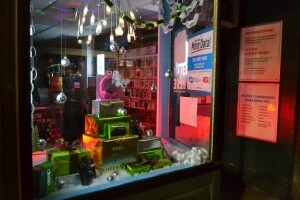 We proposed that some businesses might join if they had a bit of prompting and help decorating. In addition, we learned a staff member from the City was putting together a special display featuring the Snow Bunny and recreating a fan-favorite Polar Express train display in the former Welles Emporium. We realized that we could help make a critical mass of displays, perhaps creating an attraction that could last after City of Lights and draw people in from neighboring communities! With this in mind, we were faced with a chicken-and-egg dilemma: do we ask the businesses and find empty storefronts first, to know there was a demand? Or do we assemble a team and do fundraising first, to know that we had the resources to help? Ultimately, we did both at the same time. We knew time was a factor, and we could be careful to not promise anything as we were gauging interest. Lowell’s Special Events office had a list of downtown business contacts, which we used to send an email asking for interest in decorating help. Although we expected only one or two businesses to respond, we ultimately got more than a dozen! Some were established businesses looking for help to take their displays “to the next level”, while others were businesses that might have trouble doing anything at all if they didn’t receive help. Meanwhile, we reached out to our DIY Lowell mailing list to ask for help. After getting some great replies, we met several artists and community activists at Coffee and Cotton. Many thought there wasn’t enough time to do anything meaningful, but we argued that if we did something small-scale with the opportunity we did have, we could start earlier and bigger for Winterfest or next year’s City of Lights. 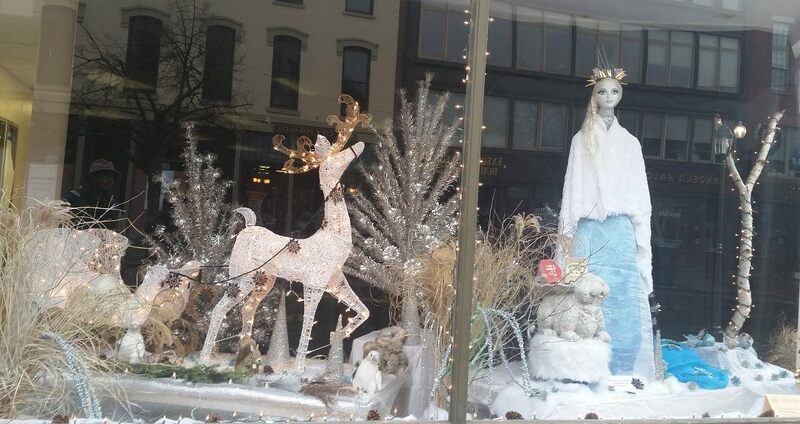 It appears to have been convincing, as Mary Hart of First Thursdays agreed to decorate a single empty window as a pilot project; Dan Rocha of ALL worked on a window for Lowell Makes; Crystal Arnott pulled a team together to do a special Humane Society Window; and Katherine DuBose Fuerst agreed to help some stores put together merchandise displays. Britt Boughner and Deborah McDuff offered to help with outreach. The City’s economic development office gave Aurora and I leads on property and business owners with empty windows that might host displays. 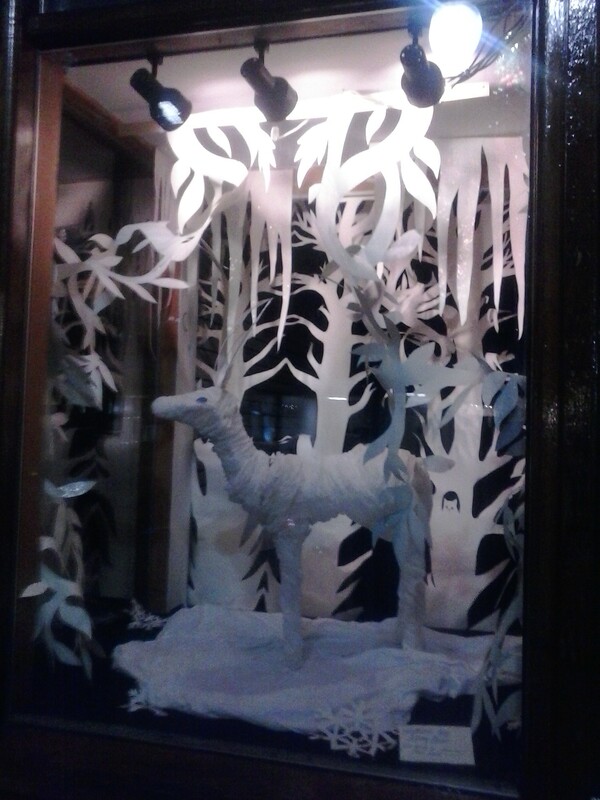 We also reached out to the owners of Hypertext Bookstore, who had not moved in and had an empty display window. We learned that flexibility was a key – many property owners couldn’t give a key, so we had to arrange to build the displays during certain times. We also learned that art displays were often accidentally lost, meaning that we had to make sure that owners understood that we needed materials back, but we also had to be clear to artists that we shouldn’t use anything that wasn’t irreplaceable. Insurance and contracts help make this less of an issue, but also take time, money, and may scare away potential hosts. We also had to be creative. We reached out to not only empty storefronts, but also “underutilized” storefronts, which might include first-floor lobbies of banks, insurance agencies, and doctors’ offices. Meanwhile, the City made sure that public agencies such as the Career Center would also decorate their lobbies, especially in what was turning out to be a key block: Merrimack Street between John and Kirk. It was important because so many businesses there were already planning to decorate or participate in City of Lights in other ways, it was the planned location of the City’s Snow Bunny/Polar Express display, and there were a lot of opportunities to make this a marquee block by decorating remaining stores. In some cases, stores had their own decorations, and they just needed help putting them up. In other cases, they donated money to build a display. Others donated sweat equity, helping put up decorations we provided. Property owners donated space, but required us to provide all materials and build displays ourselves. With that in mind, we conducted a campaign with a goal of $500. We raised $400, which was still enough to pay for all the supplies we needed that weren’t donated with a small amount leftover to provide modest thank-you gifts to the artists that worked with us. We learned a few things doing the fundraising. Firstly, while we thought that many people living downtown would donate $10 or $20, in actually, the funds came from larger gifts from a small number of people. Just as in previous efforts, direct appeals worked best, providing more than half of the donations, while the other donations came from those who heard about the project and wanted to help. We researched a number of online platforms for fundraising, including gofundme, fundly, and direct PayPal donations. We ultimately settled on a lesser-known platform called “Razoo” because they took the smallest cut while still providing tools such as social media sharing and tracking of donors. The back-end was easier to use, and they send one check to our fiscal sponsor, which made things a lot easier than individual payments. However, we have no idea if anyone was afraid or confused about the less-known name (as opposed to something like kickstarter). We ultimately put up a number of displays, some of which have good stories that we will share in a future post. Because of our limited resources, we chose businesses that might have extra challenges in putting up limited decorations. Sometimes, I felt as if we were cheating, because several of the displays were handled between the business owner and volunteer, and we only played “matchmaker.” Our hope is that we can continue matchmaking in the future, but also use our skills to promote and fund participating businesses and artists. 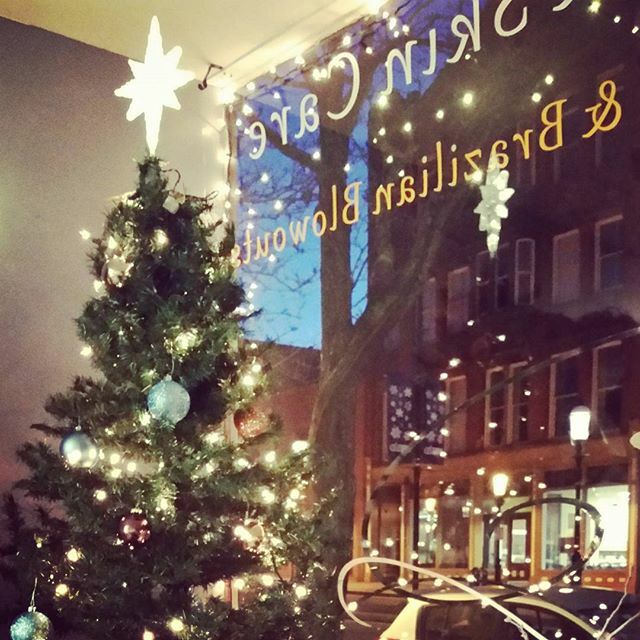 The first was an idea to bring area nonprofits together to create holiday displays that also promote their missions. The Humane Society might be joined by CTI, CBA, Lowell Transitional Living Center, or others in creating small displays that could be installed in empty or underutilized storefronts. 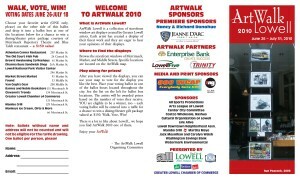 The second was to recreate the Art Walk, only in the winter. 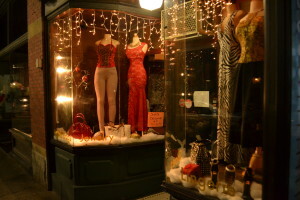 Artists display works in empty or underutilized storefronts from City of Lights to Winterfest, and a trail is developed and promoted for the season. 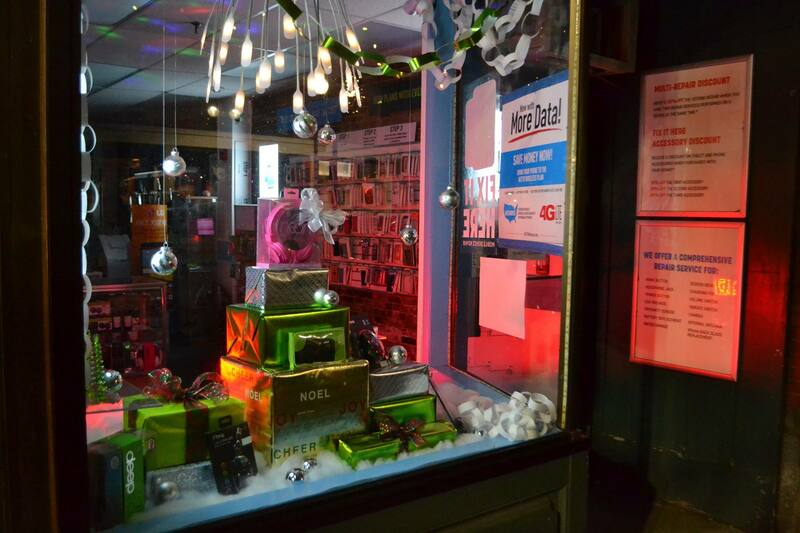 Perhaps $200 per storefront would be budgeted for materials and artist stipends. Of course, we also want to expand the program of teaming with artists to create merchandise displays in stores that might not otherwise have them, re-using our decorations year to year while also collecting more and more. We will hopefully determine what we’ll pursue over the summer, and start in early fall to do an expanded program with more promotion! Part of our goal for the Blog is to share lessons learned. What did we learn from this project? There is a huge appetite for both basic help in decorating and professional artist-led displays in existing storefronts. Property owners are quite willing to host displays if artists can be flexible, but it may take more work to find the right balance between accommodating both hosts and artists. We should continue to be careful to have clear communication between potential hosts and volunteers, so everyone knows what to expect. Budgeting time for double-checking may be important. A lot can be done in a small amount of time, but finding volunteers is a slow process that may need to build from year to year. The City’s Economic Development and Special Events offices were huge helps, so long as we were able to do most of the footwork. Merchandise displays require a special touch working with the storeowners to understand what their unique customers respond to, but also educating the storeowners on best practices. Merchandise displays also require understanding of how to balance or enhance being eye-catching and secure. Promotion takes a lot of time. Although we discussed our efforts on Facebook, it would take more effort to advertise outside of our immediate circle. Displays may be unexpectedly need to be taken down earlier than expected, and it’s unclear how this might affect promotion and how we can prepare for or mitigate this. Fundraising is still tricky, and more work might be needed to see if a small-donation model is feasible. Look out for future posts about specific displays and other lessons learned! We want to recognize and extend a thanks to Britt, Christine, Corey, Dan, Jack, Julia, Katherine, Mark, Mary, Meghan, Michael, Paul, Samantha, Sheila, Lowell Humane Society, Lowell Makes, Mills42, and Taupier Real Estate/120 Merrimack, who donated decorations, space, time, and/or money to the project. We’ve made downtown brighter together.